THIS HOME ONLY OFFERS MONTHLY RENTALS. Islamorada is known as the 'Sport Fishing Capital of the World.' This property is located just minutes from the Atlantic Ocean, where you can head off shore to the Gulf Stream and reel in the big game, or travel into the Florida Bay, where you will find vast amounts of flats for fishing. Charter Boats and rental boats are within a 1/2 a mile or bring your own and enjoy our brand new dock with fish cleaning station. Boat ramps are close by. For the dive and snorkel enthusiasts there are many reefs to explore; Alligator Reef, Tennessee Reef, Hens and Chickens are just to name a few. Islamorada is the best place to boat - there are many bridges to access the ocean / bay; number of restaurants on the water to enjoy cocktails, fabulous foods and live entertainment. There is also a Homeowner's Beach directly on the Bay. Sandy beach, grills and picnic tables. A great place to watch our beautiful Keys sunsets. The home offers covered parking, water at the dock and it is very clean. Call or email today with any questions you have. This is my parents house, that I manage. I live directly across the street - so if there is anything that you need, I can be easily reached. This home is well maintained. 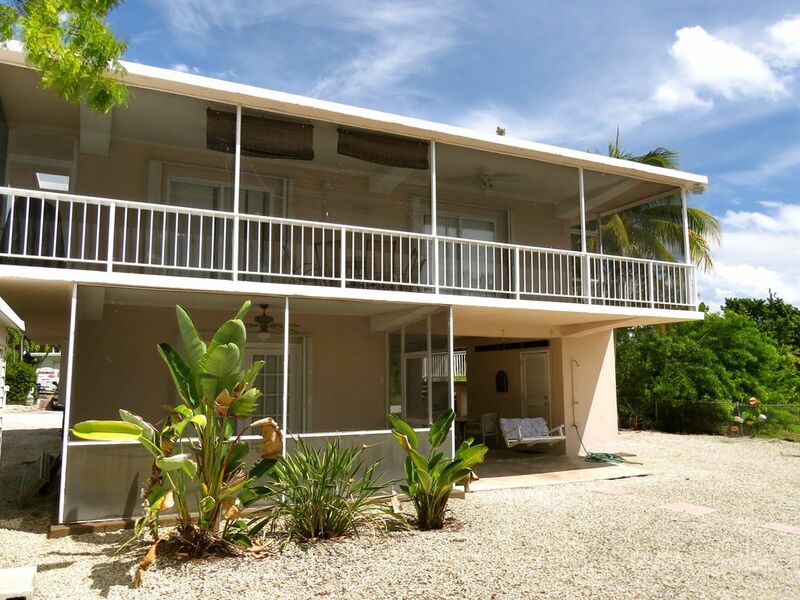 Located on Lower Matecumbe Key with easy access to the Florida Bay / Everglades National Park and the Atlantic Ocean. Bait freezer, outdoor rinse, screened porches, easy access to Florida Bay and Atlantic Ocean. Downtown Islamorada is located 7 miles away on Upper Matecumbe Key. You can get there by car or boat. Many great restaurants, shopping and exploring. This home is located on a canal with 60' of dockage / 4' control depth. There is a vacant lot directly across the canal and a vacant lot on one side of the house. Access to Homeowner's Park directly on bay - beach, grills and picnic tables, this house has 2 bedrooms and 2 baths upstairs and a separate apartment downstairs. We love staying at White Marlin Beach. The quick big water access and the sandy beach are wonderful. The home is spacious and the kitchen very well-equipped. The location is perfect for us. Very clean. Excellent location.very nice neighborhood . Our favorite place to b n the keys! We really enjoyed our time here. We had easy access to the backside or the ocean depending on the weather, which was great the whole month we stayed, June '18. We had mosquito issues but that is common to the keys and something we were prepared to handle. I wish there was more lighting on the dock area and cleaning station, but those are minor details to the overall. We had a blast and would go back in a second if we could. Thanks Mike for the thoughts! I will see what I can do about more lighting at the dock and fish cleaning station. You guys were great tenants! Spent 5 weeks at home and enjoyed every day. Access to Bay and ocean just minutes away. House was clean, convenient, and plenty of room for everybody. We loved the location, the house, and the hosts. The site is private, but on a canal. The neighborhood is quiet and friendly. The house was clean and well-kept. Any problems or questions we had were addressed by Claire & Curt expeditiously. We will return and recommend this property to our friends. Clean, neat and new kitchen. Close to bay and ocean for fishing. Owner was more than helpful and easy to contact. Everyone had a great time, parents, teens and granddad. This is a smoke free home. No Pets allowed.